This past Thursday, Samsung woo’ed consumers with the announcement of the Galaxy S4, Samsung’s newest Android-based smartphone. Many smartphone users are already looking to purchase the device as soon as it reaches retail shelves; those in Italy, however, might be dealt with a slight blow as the price for the new handset will come higher than expected. This snipped comes from an alleged source within Samsung Italy, which has also provided extra details on the device’s internal hardware specifications and general availability. 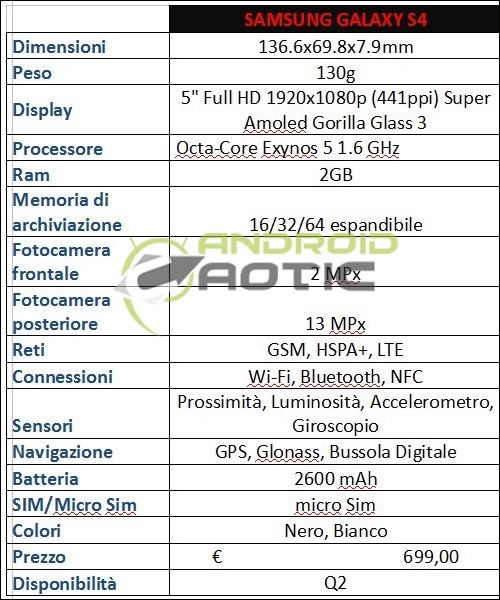 According to the leak, Italian customers will be slightly disappointed, at least initially, by the pricing structure in the country: indeed, the Galaxy S4 will set customers back a whopping €699 in Italy (equivalent to $914), while customers in the European Union should expect to be around €599. The device’s release date will also vary, reaching the shelves of most European countries on April 26th (the same date as the general availability in America); however, Italian customers should not expect to receive the device before the second week of April. According to the same source, the slight delay is due to the fact that the Italy will receive a slightly different variation of the standard Galaxy S4, packed with an Octa-Core Exynos as opposed to the Qualcomm processor that will be built into the handsets that will ship in most countries. While Samsung’s suggested price is indeed punishingly high for our European friends, there is the chance that handset retailers might offer the handset at a reduced price, bringing it closer to the European average. While price drops are not expected to be severe right away, strong discounts are to be expected closer to the holiday season as retailers seek to dispose of existing stock. 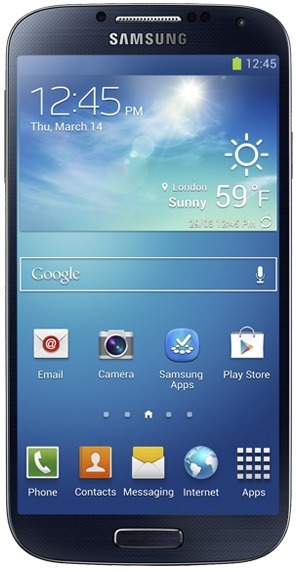 The Galaxy S4, first announced last Thursday, is Samsung’s newest flagship smartphone. It features a thinner design when compared to the previous model, the Galaxy S III, and sports a large 4.9-inch screen. The new handset also features many new built-in apps. Consumer interest has been strong so far, with Galaxy S4 pre-orders in the UK massively beating expectations. We are left to hope that the heftier price tag for customers in Italy will not choke off this initial customer excitement.